Think she has just put her Trog down ! 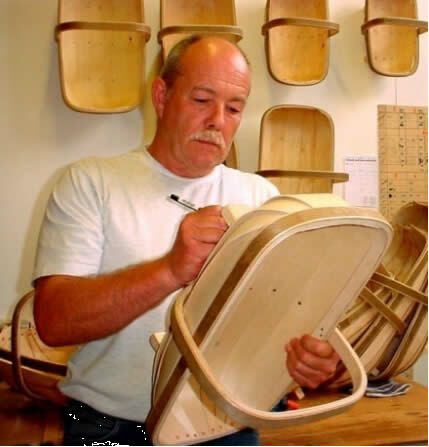 Kevin started with Birch nearly 40 years ago, so I think we can call him ‘traditional’ now ! He’s so justifiably proud of his trug baskets, he signs every one ! He makes me paint all day – then sends me out to pick stuff for his supper. 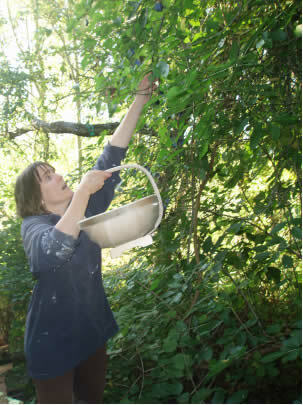 Mind you, not all the Damsons made it to the Trug ! Here is a Size 8, which is 4 Gallon, Size 7 which is 3 Gallon and Size 6 which is – Oh, you guess ! So we ask you for a contribution towards costs of £6.95 per order, but you can order as many Trugs as you like for the same amount. As always, if you are buying anything as a gift, just let me know if you would like me to drop a note in with the parcel. Years and years ago, even before Joe became grumpy, the Anglo Saxons used ‘Trogs’ to measure all sorts of stuff, including liquid. They were really, really chunky, sort of a squashed boat shape, and hewn from solid timber. Well, they died out centuries ago, or perhaps all the people that used them did – can you imagine how much they weighed ! 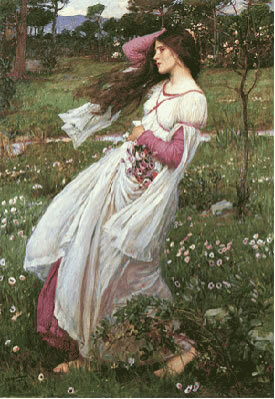 I’m told the last recording of Trogs was back in the 17th Century when a Sussex milking parlour was recorded as having “ a dozen” – hefty lasses them milkmaids ! It was in still in Sussex though that a new style of ‘Trug’ Basket was developed, this was back in the early 19th Century by a chap called Tom Smith. 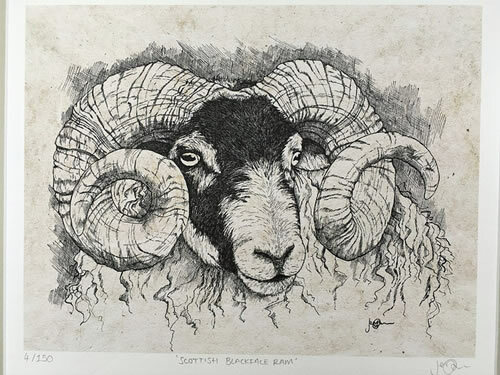 He sacrificed carrying liquids for the sake of lightness, and the ‘modern’ trug of slats nailed to a frame and handle that has been steamed, and then shaped by hand, was born. 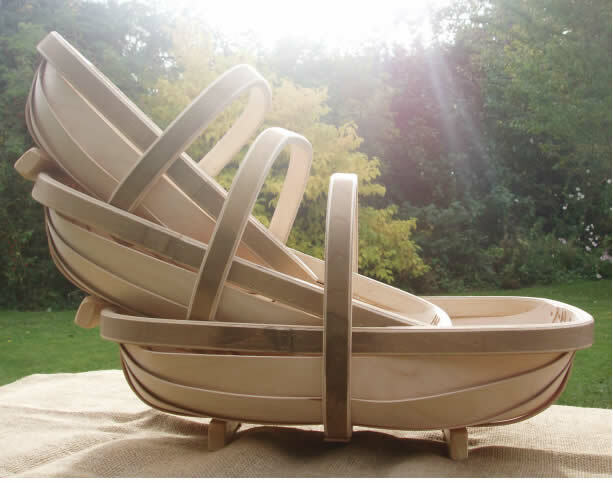 Our trug baskets are carefully hand made in the traditional way, still in Sussex, by Kevin. Willow, the traditional ‘basket’ wood, is great but does need a bit of looking after. Birch on the other hand you can leave around outside for ages, it will come to no harm. It was innovations like this that won Kevin the BSI ‘Kite’ label for his design. 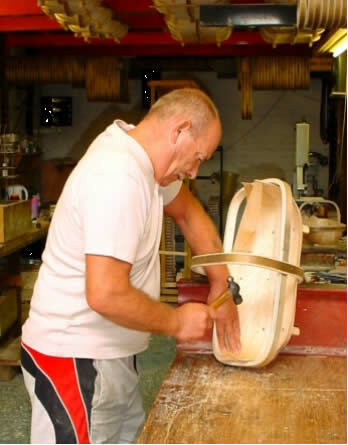 He really is one of the last trug makers in the country, although he has very mixed feelings when he sees his trugs displayed at Antiques Fairs. Do you think one day your Granchildren be be taking a signed “Kevin Trug” to the ‘Antiques Roadshow’ ? 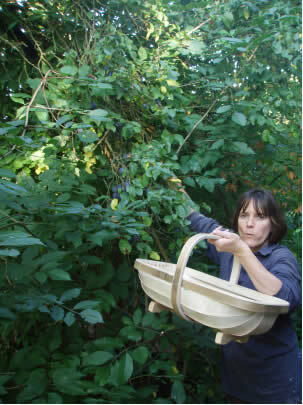 Do you know, never knew I needed a Trug – ‘til I had one ! Mine’s a number 7, but I do make sure not to fill it up too much. 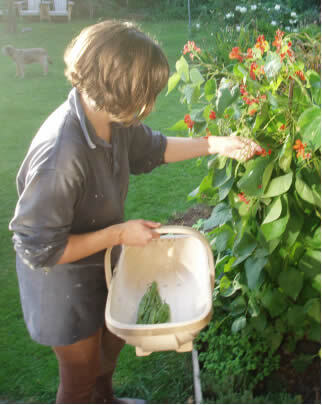 You do not really need to varnish or protect your trug, it’s not just me being lazy. However, Kevin tells me that if you really want to protect it further, use ordinary Sunflower oil. He doesn’t say why Sunflower oil, he’s sometimes very mysterious is our Kevin. I do know, though, that loads of people like to use them inside the house. Filled with soaps in the bathroom, logs in the lounge, eggs in the kitchen, there are lots and lots of uses. 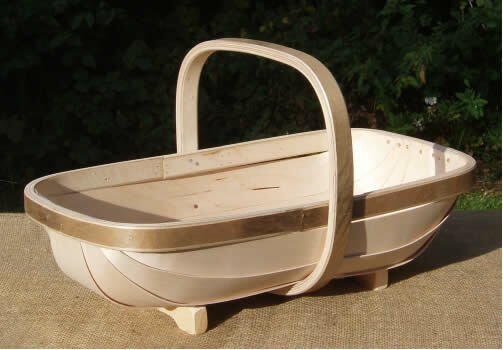 If you are going to use your Trug indoors, it can look really lovely with a coat or so of clear varnish. Our local restaurant keeps a varnished one in the ladies loo for little hand towels. 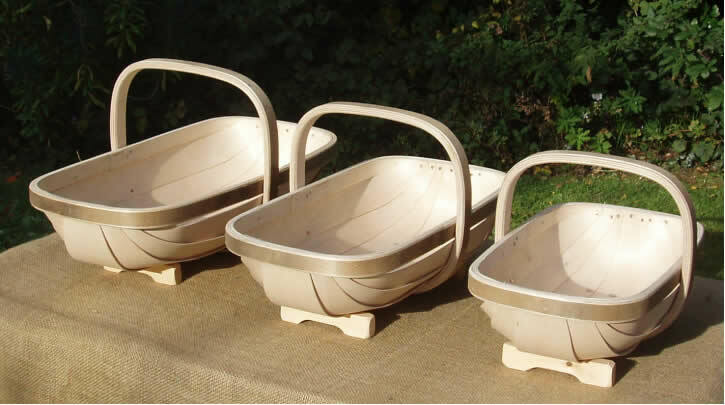 We really are so very proud to sell Kevin’s hand made Trugs, they are such wonderful examples of rural craftmanship. Not only are they so versatile, they make really lovely, useful presents. This Number 8 is 23” long by 12”wide, and holds an awful lot. This Number 7 is 20” long by 11” wide, and holds a lot. This is the Number 6, 17” long by 10” wide, it holds quite a bit.